The AD9518-1 provides a multi-output Clock Distribution function with subpicosecond jitter performance, along with an onchip PLL and VCO The on-chip VCO tunes from 2.30 GHz to 2.65 GHz. Optionally, an external VCO VCXO of up to 2.4 GHz may be used. The AD9518-1 emphasizes low jitter and phase noise to maximize Data Converter performance, and CAN benefit other applications with demanding phase noise and jitter requirements. The AD9518-1 features six LVPECL outputs (in three pairs). The LVPECL outputs operate to 1.6 GHz. Each pair of outputs has dividers that allow both the divide ratio and coarse delay (or phase) to be set. The range of division for the LVPECL outputs is 1 to 32. The AD9518-1 is available in a 48-lead LFCSP and CAN be operated from a single 3.3 V supply. An external VCO which requires an extended voltage range, CAN be accommodated by connecting the Charge Pump supply (VCP) to 5.5 V. A separate LVPECL power supply CAN be from 2.375 V to 3.6 V.
The AD9518-1 is specified for operation over the industrial range of 40C to +85C. *AD9518 is used throughout to refer to all the members of the AD9518 family. However, when AD9518-1 is used, it is referring to that specific member of the AD9518 family. This is one package pinout of AD9518-1,If you need more pinouts please download AD9518-1's pdf datasheet. 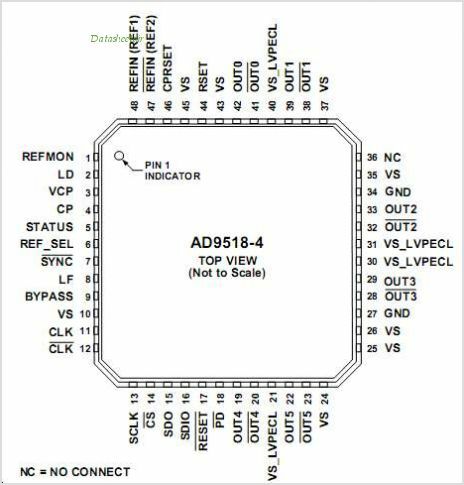 AD9518-1 circuits will be updated soon..., now you can download the pdf datasheet to check the circuits!